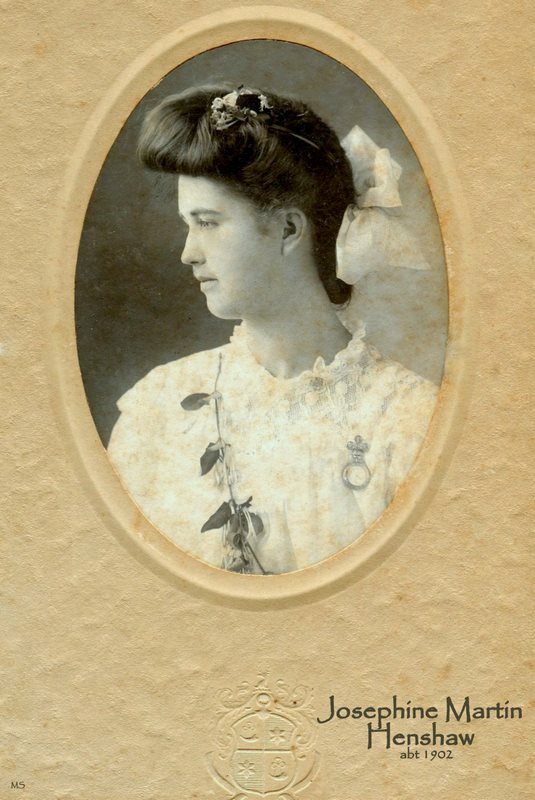 Henshaw, Josephine, head-of-household, age 30, born in Texas; parents born in Texas; widow; occupation: none. Henshaw, Bobby, daughter, age 4, born in Oklahoma; parents born in Texas. Henshaw, Edith, daughter, age 2 years 1 month [unclear], born in Oklahoma; parents born in Texas. 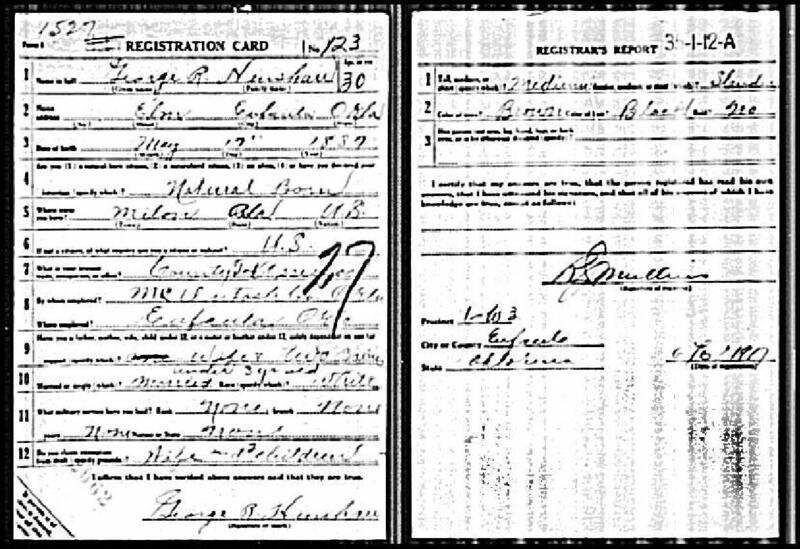 Henshaw, George, Jr., son, age 1, born in Oklahoma; parents born in Texas. Henshaw, Josephine, head-of-household, Indian, age 37, born in Texas; father born in Texas (mixed); mother born in Texas (mixed Cherokee); widow; owned home ($2,500 value); no radio in home; occupation: county clerk, courthouse. Henshaw, Bobbie, daughter, Indian, age 14, born in Oklahoma; father born in Tennessee; mother born in Texas; attended school. 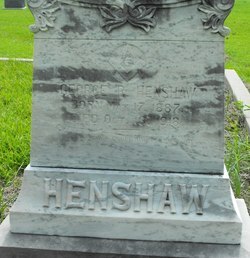 Henshaw, Edith M., daughter, Indian, age 13, born in Oklahoma; father born in Tennessee; mother born in Texas; attended school. Hinshaw, Josephine, head-of-household, Indian, age 47, born in Texas; completed 2 years of college; on Apr 1 1935 was living in the same house; owned home ($2000 value); $145 wages in 1939, plus other income. 1920 census, Eufaula, Eufaula Township, McIntosh County, Oklahoma; roll T625-1471, ED 47, page 12A, line #11, dwelling #41, family #42. 1930 census, Eufaula, Eufaula Township, McIntosh County, Oklahoma; roll T626-1914, ED 11, page 4B, line #86, dwelling #102, family #105. Contribution from Randall Henshaw Smith. 1910 census, Turner Township, McIntosh County, Oklahoma; roll T624-1260, ED 79, page 320B, line #73, dwelling #42, family #45. 1900 census, 16th District, Franklin County, Tennessee; page 237B (sheet 8B), line #53, dwelling #143, family #145. 1900 census, Oolapah, Township 23, Cherokee Nation, Indian Territory; roll T623-1844, ED 21, sheet 9, line #30, dwelling #66, family #66. Contribution from Melba C. Stewart (). Ancestry Family Tree data posted by "sooners711". 1940 census, Eufaula, Eufaula Township, McIntosh County, Oklahoma; roll T627-3310, ED 46-12B, page 4A, line #16, household #70.